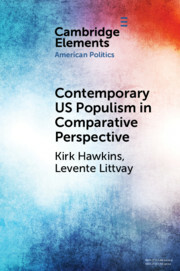 The Cambridge Elements Series in American Politics publishes authoritative contributions on American politics. Emphasizing works that address big, topical questions within the American political landscape, the series is open to all branches of the subfield and actively welcomes works that bridge subject domains. It will publish both original new research on topics likely to be of interest to a broad audience and state-of-the-art synthesis and reconsideration pieces that address salient questions and incorporate new data and cases to inform arguments. Individual Elements contributions are at a length (20,000-30,000 words) that is longer than a journal article but shorter than a book. This length allows for more scope and depth than is available in the narrow confines available to scholars publishing in journals. Authors can also conceive and write an Element on a shorter timeline than is feasible for a scholarly book. Evolving circumstances and emerging problems give rise to new questions and scholarly concerns - often on a short timeline. The accelerated publication speed possible in the Elements series will enable authors to quickly communicate new scholarship, fresh data, and recent examples to their audiences.